Next in our series of side dishes for your summer barbecue is this here amazingly delicious orzo, pesto and pepper bake. And boy howdy, is this ever good. 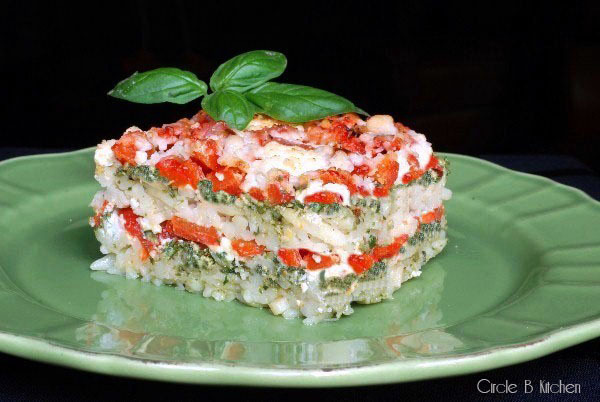 What we have here is cooked orzo mixed with parmesan cheese and layered with basil pesto, goat cheese and roasted red peppers, topped with more grated parmesan and then baked until it’s all goo-y and luscious and totally addicting. As I mentioned here, I love barbecues, but not usually because of what’s on the grill, but mostly because of what’s in all those bowls and pans sitting next to the grill. I’m a side dish girl, and I make no apologies for it. So when I came across this recipe in the newspaper a while back, I tucked it away for future reference. And that moment came yesterday when I decided it would be perfect next to our grilled salmon. I was ever so right about that. The original recipe called for rice, which I just wasn’t all that excited about. So I substituted orzo and it was divine. Maybe I should have tried the rice first, but the orzo seemed like such a natural fit with the rest of the ingredients that I couldn’t resist. But I’m going to include the rice option in the recipe and you can decide for yourself. As great as this is as a side dish, I have to say that it would make a great vegetarian main dish too. Served with a crisp green salad and some perfectly ripe summer fruit, it would definitely make a great summer meal. It’s just as good served at room temperature, which makes it an ideal make-ahead dish if you’re taking it to someone else’s barbecue. The original recipe calls for rice, but I substituted orzo, which we loved. But I may try using a short-grained brown rice next time around. Preheat oven to 400 degrees. Combine rice, 1 1/2 cups Parmesan cheese, salt and pepper in a medium bowl. Spray a 7-inch-diameter souffle dish or springform pan with non-stick vegetable spray. Place 1/2 of rice mixture in bottom of prepared dish or pan. Pat down well. Spread 1/2 of pesto evenly over rice and sprinkle with 1/2 of goat cheese. Layer 1/2 of red peppers over goat cheese. Repeat above layers. Sprinkle remaining 1/4 cup Parmesan cheese over top. Bake 12 to 15 minutes in preheated oven. Cut into wedges to serve.